Pink Lemonade ~ bright, tart and lightly sweet, this lovely pink hued summer beverage is very refreshing and super easy to make! Lemonade is a very popular summer beverage but we don’t often see pink lemonade on the picnic table anymore. The pink hue comes from a splash of good-for-you cranberry juice, so there are no artificial colors in this recipe! 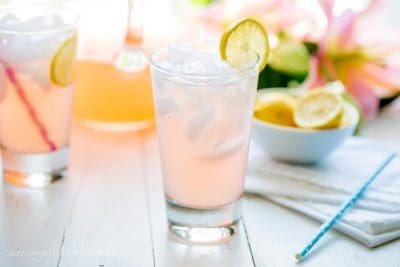 Feel free to customize your lemonade by making it a little sweeter, or add more cranberry juice for a deeper pink color. Be sure to use fresh lemons for the best flavor. Real deal lemonade is meant to be tart, so pucker up! Now days our soft drinks and prepackaged juices have gotten so sweet I think we’ve forgotten what the natural flavors of lemon and cranberry taste like. 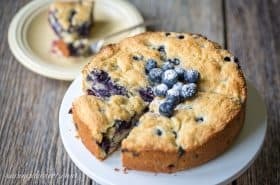 That may seem like an odd statement from a baker than posts dessert recipes on a weekly basis, but one dessert a week seems okay to me as long as we don’t make a habit of sugar laden drinks and treats several times each day. Lemons naturally promote hydration, are good for your skin, and are also loaded with vitamin C. Don’t forget all the health benefits of cranberry juice too! Recently, I introduced one of my granddaughters to The Sound of Music. In one of the scenes Captain von Trapp is outside on the patio with his friend Max and soon-to-be fiancé Elsa. They are sharing a pitcher of pink lemonade and the Captain comments that he thinks he is brave enough to try a glass. You don’t have to be brave to try a glass of this lemonade – you’re going to love it! Make a simple syrup by combining the granulated sugar with 2/3 cup of water in a small saucepan. Heat over medium-high until it comes to a boil. Remove from the heat and set aside on a rack to cool. While the simple syrup is cooling, juice the fresh lemons. Strain the juice into a 2-cup measure or small bowl, and discard the seeds and solids. Strain again over a pitcher to serve. Add the cold water, cranberry juice and cooled simple syrup to the pitcher with the lemon juice. Stir well to combine. Serve the lemonade poured over ice garnished with fresh lemon slices if desired. 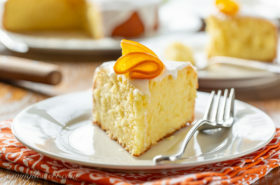 I would plan on 10-12 lemons for this recipes. Since the size and juiciness of lemons vary greatly, better to have more than not enough. If you have any remaining lemons, slice thinly for a garnish. Roll the room temperature lemons under your palm on a hard countertop to help release their juice. Don't add ice to your pitcher as it will dilute the lemonade. If you or your guests prefer a sweeter lemonade, increase the amount of simple syrup you make and have the extra available to stir into each serving as needed. PIN to your favorite Beverage Board! If you’re looking for more inspiration, check out our terrific Frozen Strawberry Lemonade recipe from the SRFD archives. For a summer grown-up drink, don’t miss our Frozen Strawberry Margarita that tastes more like a fantastic sorbet. Jennifer at Seasons & Suppers posted this beautiful Cold Brewed Iced Tea with Fruit – and I can’t wait to give it a try. And finally, don’t miss this gorgeous Blueberry Lemonade from Sue at The View from Great Island. To all our American readers – we hope you have a safe, happy and wonderful 4th of July holiday! Thanks so much for stopping by! So pretty in pink! 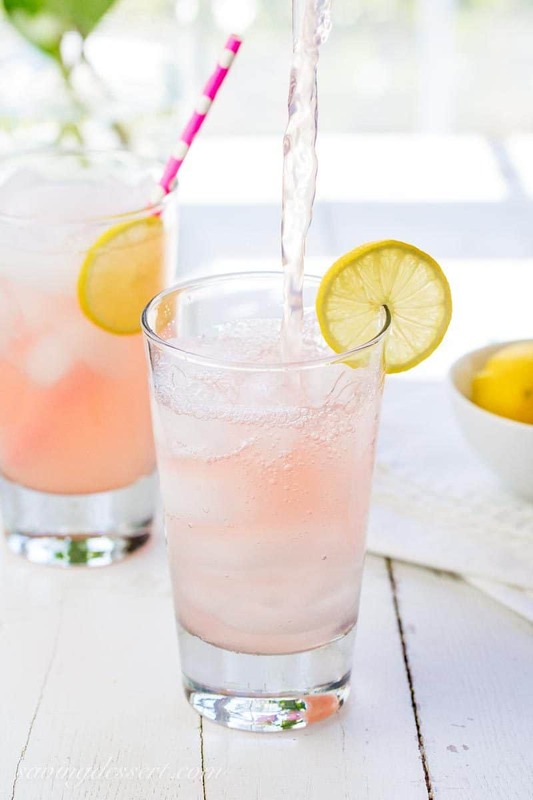 Seriously, your photos are so beautiful and the pink lemonade looks so refreshing. 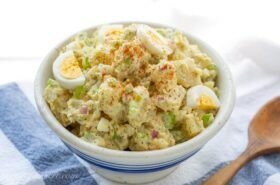 I want some today! Thank you Susan! It is a refreshing drink for these hot summer days. Happy weekend! 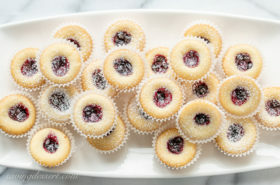 Just joined your website, your recipes are fantastic, can’t wait to try the lemonade and all the Blueberry recipes. The perfect beverage for this time of the year! Haven’t had pink lemonade in ages — and of course you have me craving it now. Thanks! 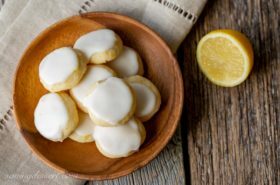 My husband likes to buy the powdered lemonade mix :/ I’m going to make this for our next summer gathering—he’ll be impressed! This may not be as sweet as the powdered drink mixes so adjust if needed. The taste is so refreshing – I just love it! Ohhh I love the idea of club soda in lemonade – I’ll give that a try Monica. Thank you! 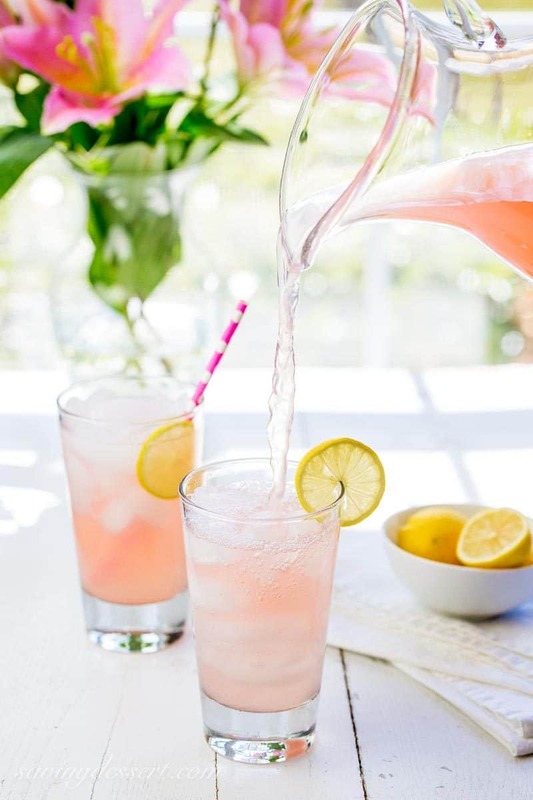 Your pink lemonade looks wonderful, just right for a hot day. Happy 4th Tricia! Thanks Gerlinde – happy 4th of July to you too! I couldn’t ask for a prettier post on our first sunny day in DAYS..I may try and make this into a one glass deal for moi:)It is too pretty and it will make me get more cranberry juice. So happy you had a pretty day – and hope you enjoyed your holiday weekend. More cranberry juice is always a good idea 🙂 Thanks Monique! It’s crazy hot here too Sue! Thank you so much – this is very refreshing on a hot day! So that’s how it gets pink – looks very refreshing. On our recent RV trip one of the guys always drank lemonade. Thanks Larry – it is light and wonderful and very refreshing. Enjoy your holiday! Why is it that pink lemonade is so much more special that regular lemonade. I love that you made yours pink with cranberry juice too, what a great idea! Happy 4th Tricia, enjoy lots of this beautiful lemonade! I don’t know Chris – but it is delicious!!! Happy 4th of July to you and Scott! Ain’t that just pretty! Have a great week ahead, Tricia.